Sensex has already crossed level of 20000 in 2013. Looking at current FII investment and expert’s views market may show positive trend in 2013. Budget is nearby and with expectation of special benefit in Union Budget 2013-2014 volume buying is going on in various sectors. Sectors which are booming before budget are Power, Infrastructure, Banking & Pharma. FII focus on this sector has increased and they are making investment in these sectors. Reforms in energy and infrastructure are ON and still some benefits are expected in budget. Some special provision will be made in research and development in pharma sector. Banking field is still attractive. As it is last budget of current Government it is likely to be more popular. Technically Nifty has support level on 5930 and 5835. Unless this level is lost we do not expect major correction. Most of expert believes that Sensex will cross level of 22000 in 2013. 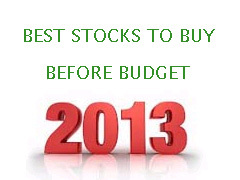 Here are best stocks to buy before Union Budget 2013-2014. ITC is in leading FMCG Company. Profit of this company is expected to grow by 20%. Recently ITC is planning to invest Rs 1,000 crore in food and consumer goods sector in the next two to three years. The company got the possession of 39 acres last week at Panchla in Howrah district where it would build an integrated food and consumer goods facility. The stock’s price-to-earnings (P/E) ratio is 38.96. The latest book value of the company is Rs 23.79 per share. At current value, the price-to-book value of the company was 12.22. The dividend yield of the company was 1.55%. In Long term this stock may reach to level of Rs 400.
price is deregulated now in long term this company will get advantage of the same. Subsidy is removed now and company will likely to enter in profit stage. Current price-to-earnings (P/E) ratio is 9.48. Latest book value is 153.68 and dividend yield is 1.27%. This share is expected to reach level of Rs.495. In last couple of weeks we have seen IDFC has been moving in Rs 175-180 range. I would assume that in spite of the news that it is not in for a banking license and so many other things. It is probably going to be a steady outperformer. It has support on 168 Rs/- near time target for this stock is 192 Rs. Current EPS is 10.5 and book value is 86. Most of brokerage house is recommending this stock to keep in your portfolio. I recommend a midcap pharmaceutical company Cadila Healthcare as a good buy before budget. So at Rs 888, I recommend a buy on Cadila for long-term investors with a target price of about Rs 975. L&T is one stock that has been left standing in the infra space. We know that the others are down anywhere from 70-90 percent, but I think this is a rock solid name and if investors out there are looking at playing the infra space, it is the best bet. In fact over the past few days we have actually seen fair amount of short covering and long build up in L&T as well. The share touched its 52-week high Rs 1,719.50 and 52-week low Rs 1,185.00 on 29 October, 2012 and 04 June, 2012, respectively. Currently, it is trading 8.76% below its 52-week high and 32.4% above its 52-week low. Market capitalisation stands at Rs 96,475.41 crore.